Wine Spectator Top 100 Value of 2018!! Wine Spectator Top 100 Value of 2018! In 1962, Fabrizio and Giuliana Bianchi established Castello di Monsanto. They began by planting new vineyards and converting the numerous farmhouses on the property which were homes for the local farmers. Today, Monrosso is the offspring of Castello di Monsanto and is produced in the southern hill part of the property planted with Sangiovese, Canaiolo, Syrah, Merlot, and Cabernet. The Monrosso production is run by Fabrizio and his winemaker daughter Laura Bianchi. Fabrizio and Laura have consistently been innovators within their region. It only made sense that they would continue this philosophy by creating the Monrosso project in 1998. All the Monrosso grapes are carefully hand harvested and then softly crushed. 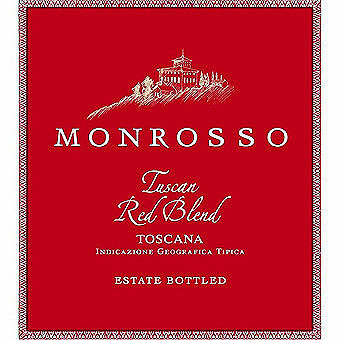 The Tuscan Red Blend IGT is composed of 60% Syrah, 32% Cabernet Sauvignon, 5% Merlot and 3% Sangiovese. This Tuscan Red Blend was created for those seeking adventure. Wine Spectator scored this 92 points. They said "Bursts with ripe cherry, blackberry and floral aromas and flavors, driven by lively acidity and elegant frame. Balanced, yet firmly supported by dense tannins. Syrah, Cabernet Sauvignon, Cabernet Franc, Merlot and Sangiovese. Best from 2021 through 2033."